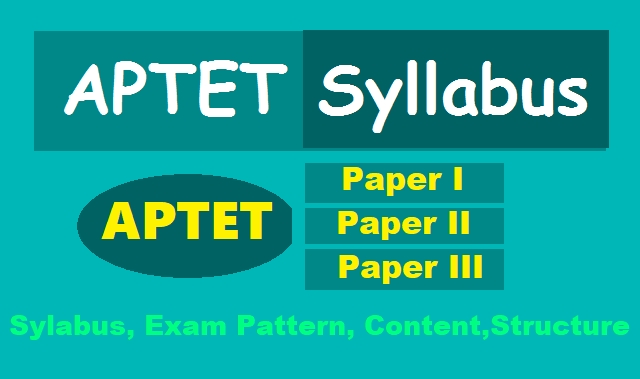 APTET Paper III for Language Teachers, APTET 2019 #Syllabus APTET Paper I, Paper II, Paper III Sylabus, #Exampattern, Content, Structure Download. APTET 2019 Exam Syllabus, APTET Paper I Exam Syllabus, APTET Paper II Syllabus, B.Ed Syllabus for APTET, D.Ed Syllabus for APTET, LP Syllabus APTET, APTET 2019 Exam Pattern, Content, Structure, APTET Paper I Exam Pattern, Content, Structure, APTET Paper II Exam Pattern, Content, Structure. Language at least up to Class X.
VI. The syllabi for Mathematics & Environmental Studies are designed on the basis of topics of Classes I to V. The difficulty standard as well as linkages of content/topics could be up to Secondary Stage (up to Class X) for testing. The test items in Mathematics and Environmental Studies will contain Multiple Choice Questions (MCQs) not only on Content but also on Pedagogy. In Mathematics, 24 MCQs will be on Content and 6 MCQs on Pedagogy. Similarly, in Environmental Studies 24 MCQs will be on Content and 6 MCQs on Pedagogy. x) The list of Games and Sports for considering the incentive marks is given in Annexure. xi) 20% Weightage marks for Teacher Recruitment Test (TRT) of the State Government for Physical Education candidates will be considered on the basis of Written Marks + Incentive Marks. 20% Weightage marks will be arrived by limiting total marks to 150 only.